We are a licensed and insured garage door service company who specializes in the replacement of garage doors for residential home owners or commercial building business owners. Maybe you have a broken garage door that needs some service work or replacement. You can contact us today for a free estimate on all types of garage door service or repair needs. Maybe you need a broken garage door spring replacement or just fixing torsion springs may be helpful. We can do it all, even the whole door or the partial garage door replacements can all be done the very same day in most cases. We make garage door installation easy and affordable. We offer regular inspections and regular maintenance because it can keep your door in excellent working order and plus save you the cost of paying for emergency repair. We provide an excellent warranty for garage door replacement panels. Our certified technicians can maintain your door and inspect it for any possible damages that might cause major problems later.Our skilled technicians are fully trained, experienced and extremely knowledgeable in handling a variety of types of garage door problems including but not limited to pulley replacement, broken cable replacement or maybe the tracking that needs some adjusting. We specialize in garage door opener replacement too. Our team of technicians are fully and extensively trained and kept up-to-date on the newest garage door products and advanced repair techniques. We only use the most advanced equipment we have available to make very timely and safe repairs to your garage door. We only use the high quality garage door replacement parts. We can install garage door replacement springs. We can provide our clients a labor estimate to replace the garage door. This estimate will include removing and disposing of the existing door and the operating hardware and setting of the wall track and the suspending horizontal track, securing the track, installing and connecting door sections or panels, installing the roll up spring and the exterior weather seals, including planning, equipment, the material acquisition and the area preparation and protection. Setup and cleanup is included as well. Our loyal clients who have tried our garage door replacement service have provided us with excellent ratings sand reviews online. We offer clients to choose from several traditional style doors and to custom build the door that is best for you or your home plus your tight budget.Replacing your new entry door or garage door are two of the lowest cost improvements that can be made to not only improve your home but for the resale value of your home as well. When someone views your home from a distance then what will be the first thing that they see? 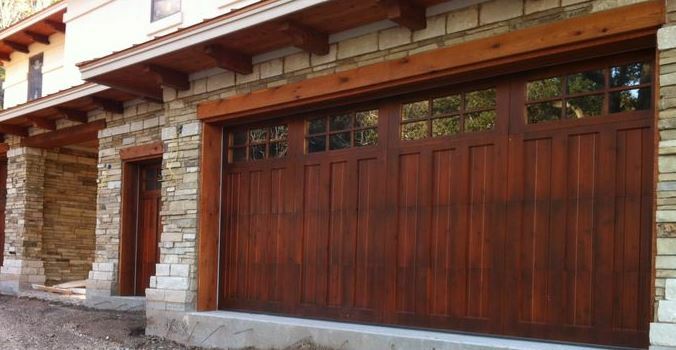 It will be your garage door because it is the largest entry door to your home . For many families it is also made the primary entrance to the family home. We can offer you a complete garage door replacement cost estimate now. Replacing garage doors are always a good idea for many reasons. One, they can add to the value of a home because prospective property buyers may want a garage to their home. A new garage door can add to the appeal, especially if the existing garage door is under duress. Elkhart Garage Door Service is professionally trained and experienced with all garage door installations. Replacing an existing door for a new one can be cause for a few reasons. Whether it’s because a homeowner accidentally ran into the bottom of their door and needs a garage door replacement panel, or the door doesn’t open as willingly and a garage door replacement spring is needed--Elkhart is prepared for it all. Our door technicians have all of the knowledge and garage door replacement parts needed for the task. We can safely do the job quickly and satisfactory. Our garage door replacement costs are affordable and competitive. Why A New Garage Door? Whether it’s a bottom panel or a garage door opener replacement needed, a new door can add better insulation and security to a home. New garage door openers have much more stringent requirements for safety and noise control. And new doors can add efficiency to the home by being durable and insulated. Our door technicians are trained to handle any potential dangers. Many homeowners don’t realize how ardous the task of replacing a door can be due to its weight and the ever so dangerous spring mechanism. While springs make life much easier lifting the door open and close, and they do last a while, unfortunately because of the regular use of the torsion or extension spring (a traditional garage door opens and closes four times a day) they will fail or falter. When a spring is failing, this is a sure sign that it needs total replacement. You’ll know when a spring needs to be replaced by the sound and weight of the door. We are properly certified to handle all tasks safely and correctly. If a garage door doesn’t open correctly, that must mean it doesn’t close appropriately or at all. This can be dangerous in keeping out unwanted visitors such as animals and thieves. We will assess the garage door to see where the fault starts and choreograph a plan to provide a solution. There are many moving parts involved in finding a replacement garage door. That’s why hiring a professional is a smart move. We know the ins and outs of all commercial and residential garage door replacement parts. From weather sealants, remotes and keypads, gates, rollers, hinge pins, brackets, and much more. Then there's the door materials and styles. From aluminum to steel, fiberglass to wood, we can pick out the right design and choice that makes the most sense for any homeowner. Replacing a garage door doesn’t have to be difficult, contact Elkhart Garage Door Service for a new and improved garage door for your home.